With 401(k) Day falling on the first Friday after Labor Day, September is a great time to consider retirement and what this stage of life means to you. 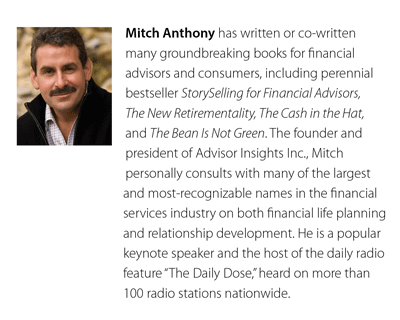 In The New Retirementality, best-selling author and frequent Baird speaker Mitch Anthony presents an unconventional way to think about retirement – and why you shouldn’t wait until age 65 to start living the life you want. Retirement – as most people understand it – is incompatible with modern living. The popular conception of “retirement” comes from the nineteenth century and the Industrial Revolution. At that time, the physical strain of manual labor took a toll on the health and productivity of workers, and businesses seeking to maintain a younger, stronger workforce needed to displace its older laborers. According to a recent poll by American Demographics, 41% of respondents reported having difficulty adjusting to retirement – a greater percentage than for parenting (23%) and marriage (12%) combined. Today’s companies may not realize how much they rely on baby boomers’ knowledge and expertise. And given the numbers gap between baby boomers and Gen-Xers, the potential for “brain drain” as boomers continue to retire could be devastating. By choosing a profession you find personally fulfilling, you can open the door to creating a suitable work/life balance in retirement. It’s important to do what you love in your career, long before you consider retirement. Thriving in a career you’re passionate about is more likely to reveal exciting opportunities later in life. The keys to successful aging – avoiding disease and disability, maintaining mental and physical function, and living with a purpose – are all served by remaining actively engaged in a career. Having a sense of what truly makes you feel happy and alive is crucial. This insight can influence your career and ultimately when and how you choose to retire. Are there people and causes I would like to contribute my time, passion and efforts toward? How can I continue to contribute my talents in a productive and meaningful fashion? With whom do I desire to build more meaningful connections, and why? Toward the conclusion of his book, Mitch Anthony states that “the starting point for a meaningful life story is embracing the ending point, by visualizing the last page of the story – which is not death, but the last echo of your life on those left behind.” Only when you have a sense of the mark you wish to leave upon the world can you start making plans toward achieving it. 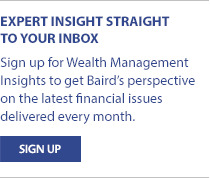 Your Baird Financial Advisor can help you shape what those plans could look like – before and in retirement – and put them into motion.